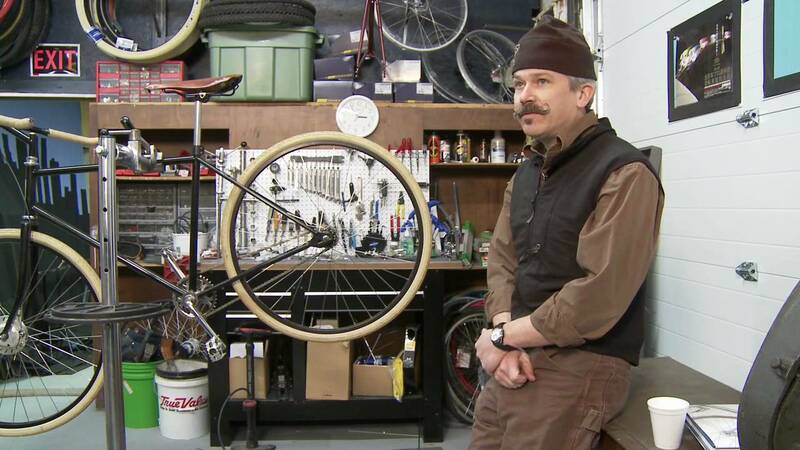 How did you learn how to build bicycles? It was a gradual process. I started at Fat City Cycles in 1989 as an assistant in the paint department. That got my foot in the door for bicycle manufacturing. I worked there for five years, ending as paint shop manager. It was a high-production facility making about 1,800 frames a year. While I was there, I taught myself how to TIG weld. It’s one of the skilled jobs in bike manufacturing and something I wanted to move into. Before I could, Fat City had been sold. I got offered a job to go with the merger company, but I declined and helped start a new company, Independent Fabrication in 1995. When we started Independent Fabrication, I was still the painter. I also became the new welder, among many other things we had to do to get the company started. That was really how I got into the manufacturing part. While I was the TIG welder, I didn’t actually make the frames. I was at IF for eight years. During that time I got immersed into the other aspects of frame building, including machining and tool making. That wasn’t my job, but I did start learning how to make things. I was building forks. Somebody quit in the fork making area so I took that over. That was really the first time I was using machines and doing the whole process from start to finish. A fork is like a third of a frame, so it’s the same process. Cutting the tubes on the milling machine. Putting them up on the fixtures for tack welding. Then welding and alignment. Doing finish work, such as grinding the dropouts down. How did you end up as a painter at Fat City? Had you already been interested in cycling before you applied to work there? Yes. Out of high school I went to work at a bicycle shop. I soon became the manager of this small little shop. I did that for about five years. Then I spent two years at an airplane factory called General Dynamics down in Texas. It was working at the airplane factory that inspired me to try to find a bicycle manufacturer to work for. I rode my bicycle cross country and ended up in the Boston area without any real plan at all beyond having a vague notion that Fat City existed. I’d been pointed in that direction by people I’d met along my travels. Essentially I just rolled into Boston with $20 in my pocket and got a job off the street at Fat City Cycles. Fat City has become something of a legend in the mountain bike world. What was it like working there in those early days? Well, they were the early days for me, but really the last days of Fat City. They were there for 13 years and I was there for the last five. The years I was there, it was pretty well figured out. They had a good staff and everybody had their job to do to get the bikes out the door. There was some funkiness to it that’s not promoted in a public way. It was a hardscrabble company from the beginning, so making payroll or staying in a good facility that wasn’t going to get swept away in the next storm was always a challenge. But we were all pretty young and resilient to whatever hardships the company had, so that’s what really kept it together. It was a little wild and crazy internally. Externally, we projected a pretty positive, fun, exciting sort of outlook. Internally it was that, but also sort of a struggle. It seems like just about every New England frame builder is just a degree or two separated from Fat City. Why did that company have such a big influence? It was big enough to employ people, for one thing. At its peak, we had about 25 people working there. And it had a high turnover rate. It was a place to have a job in the industry and it got people their start. The only other places to get your experience would be as an apprentice in a one person shop. But those just really weren’t available. Typically one person shops aren’t interested in having an apprentice because they’re more trouble than they’re worth. It costs too much money to have an apprentice hanging out bothering you all the time. Fat City and a few others at the time, like Serotta, were big enough to employ someone who didn’t know anything. You could start at Fat City in the shipping department or finishing department or even as I did in the paint department starting out sandblasting. Once you’ve got yourself in there, then it’s up to you to learn the other skills on your own. Mike Flanigan on an ANT cargo bike. Photo via ANT Bike flickr. Are there guys you were working with at Fat City who are still active frame builders around New England? The only one I can really think of is Chris Igleheart, but he’s no longer in New England. He worked at Fat City in the very early days and had left about when I got hired. He’s been in and out of business for the last 20 years, but now he’s in business again out in Portland, OR. Everybody else is really just not around anymore. You could consider Independent Fabrication. They’re still in business, so I guess that counts. There are no original people there anymore, so it’s a completely different company. Merlin came out of it. They’re out of business, but they created Seven and that’s a successful company that’s still lightly connected to Fat City. There’s Geekhouse Bicycles, which I trained so that’s another slight connection. But nobody that directly worked at Fat City is still making bikes in the New England area. I’d had enough of Independent Fabrication. I was sick of working with other people. I didn’t like the direction the company was going and I felt like I had no control over anything. I decided to leave and start my own company, purposely thinking it was only going to be me and not have any employees or business partners. I didn’t have a plan for expansion or importing things. I just wanted to be a one person shop. So that’s what I did. That was 2003. Had you always planed to focus on practical, transportation-focused bikes? Yes. It was several years in the making. I’d been doing it part time since 2001 and then in 2003 left Independent Fabrication to do ANT full time. From the get go, it was going to be transportation only. Cargo bikes, city bikes and that sort of thing. As the years went by, I had to make all sorts of bicycles–road racing, cross bikes, mountain bikes–in order to keep the business rolling. In the early-2000s, you were ahead of the curve. Now transportation-focused bikes and even bike companies are all over the place, but that was definitely not the case then. Did you know you were doing something different? Oh yes. Definitely. I aspired to it and had hoped to influence the market. That was stated clearly on the home page of the website. I felt like I was in part responsible for the turn of the tide to more transportation and city bikes, at all sorts of levels. 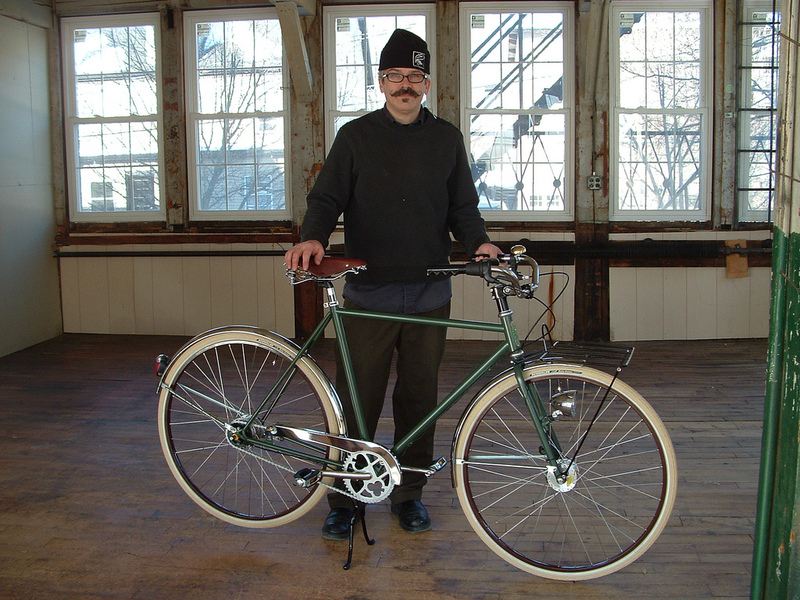 Whether it was influencing the other handbuilt makers through the North American Handbuilt Bicycle Show or through the major companies such as Public Bikes. Public Bikes emulates the type of bike I wanted to promote and was more successful at it because they have a famous furniture designer as the head of their company. Somebody like that has a lot more sway with the general public. Did it actually become harder for you as big companies like Public, Trek, Globe brought more transportation focused bikes to the market and price points came down? Yes. Yes it did. Fortunately and unfortunately. Definitely as the years went by, it became more and more difficult to sell my bicycles at the price they needed to be sold. Mike Flanigan in the ANT shop. Image via YouTube screenshot. Was that a contributing factor to you joining Seven recently? To combat the drop in business, I switched to teaching frame building classes. I did that about five years ago. That was very successful, to the point that I’d stopped taking orders for bicycles for about a year. I concentrated only on the classes. I was happy to continue with that, but frame building classes slowed down and since I’d stopped taking orders for bicycles it had cut into people’s interest in that. It was just enough to not have enough work coming in to keep the doors open. Also, since the frame building classes had been going well, I had moved to a larger facility to expand on the classes and spent a lot of money in the move. It was a good move, but my overheads went up and the business slowed down and I didn’t have enough in savings to take that hit. Seven actually contacted me about looking for a new welder. I’d given them previous students to go work for them. I told them I didn’t have anybody at the time. I thought about it for about a month and decided to call them up and see if they’d be interested in taking me on as one of their welders. Everybody was surprised to hear that news, but they were delighted to have me apply. I could’ve kept my company going, but this opportunity at Seven was very attractive to me. It’s with a lot of great people that were friends of mine. I’ve known these people for 25 years. I’m very familiar with the work environment and I know it’s a good one. It’s really the best place I’ve ever worked. It’s really clean and organized. There’s a lot of great people. It’s a really friendly environment. But at the same time there’s no slack going on. Everyone’s really involved with process improvement and keeping their quality good. It allows me to have a lot more freedom now. I’ve been self employed for 20 years. I’ve been working seven days a week often. Having a job like this that provides a good salary, allows me to stay in the bicycle business building good products, and still have weekends off and more time for myself, that was very attractive. It’s working out very well. Have you enjoyed returning to a production-style building model? In a lot of ways, it’s not production at Seven. They have a huge variety of bikes that they offer, every one of them individually crafted. They’re quite complicated and all built one at a time. So it’s only production in the sense that they do a large volume with people who have departments. The machining department cuts the tubes. The welding department tacks and welds the frames and does a lot of the alignment. They have a finishing department that does all the final bits to the frame. Then there’s paint and shipping and whatnot. More importantly, they have a sales staff. That’s where the enjoyment really comes in for me. I no longer have to sell. With big bike companies producing an ever increasing number of niche bikes, what role do you see custom builders playing in the industry? Everybody sort of has a different angle on that. For some people, there’s these new small shops that may have two or three employees such as Mosaic or Alchemy that have enough newness to them. They might be offering the same things that other people do, but since there aren’t as many around it makes them attractive. They’re doing good quality work and you get to ride something that’s a little more unique. The other angle is just getting that personal attention. Seven for example, they’re the premium of custom tailoring on a production level. They’re the ones who really first promoted that back in ’97 and are still doing well with it. Seven works through a dealer network. You buy them through a retail shop that sells Trek or whatever else. When somebody walks into a Seven dealer, they have those options of buying a Giant or Trek or any of those other fine, high-end $10,000 bike from a production company. Or they could spend the same amount or maybe even less having a custom tailored Seven and have it uniquely made to fit them and be built around the components they desire. That adds a lot of value. Do you think there are custom builders out there who are still pushing the boundaries of what’s possible or are ahead of the industry curve on what sort of bikes they’re building? Maybe with fat bikes. I think that’s probably where there’s the most room for being unique and ahead of the curve. The big companies are definitely doing well and have jumped on to it very quickly. But I think there’s a lot of guys doing really well with fat bikes, almost solely building them. For example 44 Bikes. Whereas they were virtually unknown before, they’re doing very well because they’ve attached themselves to that style of bike and have constantly developed as new components have come out. Before when fat bikes came out it was a 3 inch tire. Now they’re building around 5 inch tires and that takes a lot of thinking to make everything fit. Thankfully a lot of stuff has come with it such as the wider hubs and different drop outs and wider cranks to fit with the 100mm shells. That’s probably where the most unique innovation’s going on. This entry was posted in Bike Industry, Frame Builders, History, Interviews and tagged alternative needs transportation, ant bikes, ben serotta, boston frame builders, chris chance, custom frame builders, fat city cycles, geekhouse bikes, iglehart, independent fabrication, mike flanigan, new england frame builders, peter weigle, richard sachs, seven cycles, whitcomb cycles. Bookmark the permalink.